You are here: Home / Clinical Perspectives / Telomeres, How Long are Yours? 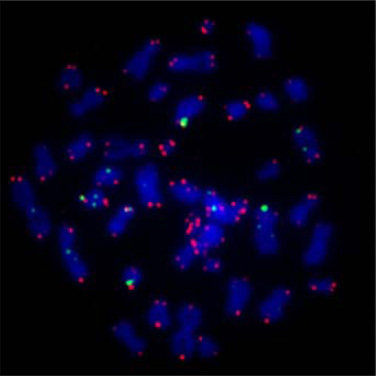 Chromosomes with telomeres in magenta. What and Where are Telomeres? Telomeres are specialized proteins which are found at the end of your chromosomes, in the nuclei of your cells. They form “caps” at the end of your chromosomes that allow your cells to differentiate the end of a chromosome from say, a piece of broken DNA. The first landmark studies of Telomeres were published in 1978. Later, their authors went on to identify the enzyme, telomerase, whose function it is to repair and maintain the telomeres. Both discoveries were deemed so important that the three principals involved in the research: Elizabeth Blackburn, Jack Szostak and Carol Greider, received the Nobel Prize for Medicine in 2009. Over the course of a lifetime, telomeres gradually burn down. Researchers describe them as being like lit candlewicks, finally sputtering out, exposing the chromosome to destruction. There is a bigger picture too. Researchers found that they could predict likely mortality in a group of individuals by measuring the length of their telomeres. Excluding accidental death, scientists found that the folks with the shorter telomeres would die earlier than those with longer telomeres. Relationships with cardiovascular disease and immune conditions were shown and suspected in other diseases, such as diabetes as well. For many years scientists thought that telomeres had a built in “aging cycle”, that they would shorten, and that this built in “shortening factor” could not be challenged. The theory went that we start with long telomeres at birth and, as we grow older, our telomeres grow shorter. When they are gone, we die. As researchers studied telomeres, however, a different picture began to emerge. In 1984 Elizabeth Blackburn and her graduate student Carol Greider discovered the enzyme telomerase and showed that it functions to repair and maintain telomeres. You need just the right amount of telomerase, not too much and not too little. Rather than a fixed “shortening factor”, when telomerase is not secreted by the body at sufficient levels, telomeres deteriorate no matter how old you are. In 2014, Elissa Epel and her colleague Eli Putterman studied 239 healthy postmenopausal women over the course of a year. During that time most of the participants experienced at least one of 13 identified life stressors: unemployment, divorce, financial problems, etc. They measured the length of telomeres at the beginning and the end of their study. Epel found that telomeres of those women suffering the most stress demonstrated the most shortening. Yet, there was a subset of these women whose telomeres did not shorten. As they evaluated the differences between the women who had shortened telomeres and those who did not, they found that the women who practiced healthy lifestyles that included exercise, eating well, and sleeping well, maintained telomere length despite their stress levels. Studies showing that behavior effects telomerase production continue to accumulate. In response, many researchers, including Epel and Blackburn, now look to healthy lifestyle management as the key to producing optimal levels of telomerase, thereby maintaining good telomere length and, in turn, a healthier and longer life. Choose organic, whole, clean, real food. This improves your antioxidant intake and reduces the amount of toxins ingested that use up nutritional antioxidants. Avoid junk foods (and GMO) such as sodas, excess sugar, diet sweeteners, chemical foods and transfats. These add a toxic load to the body and shorten telomere length. Get plenty of antioxidants, especially Vitamin C, D and E. Consider supplementation and/or a high antioxidant drink. Drink plenty pure water. It helps reduce toxic load. Increase the fiber content of your diet. Lower the average omega 6:3 essential fatty acid ratio of the foods you eat. Regular movement is a must. 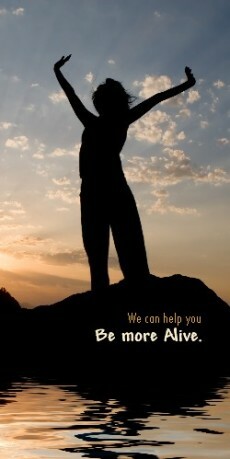 Exercise helps the body detoxify and reduce toxic load. Telomere length has been shown to respond to both endurance and resistance training. Other research has shown high intensity interval training to be best since it achieves the highest levels of healthy endorphins. Rebounding on a mini tramp has been found to stimulate detoxification at a deep lymphatic level. Smoking leads to lung cancer and other diseases. Second hand smoke can be similarly detrimental. Avoid exposure to it as well. Smokers have shorter telomeres. In addition to being coupled with poor physical function, low muscle mass, especially when associated with high body fat, is associated with elevated disease risk. Keep body fat low, especially in the visceral region, and lean mass high. Breathe deeply and diaphragmatically throughout the day. Inhalation and exhalation through your nose is believed to be even more helpful. It filters and conditions your air and it increases Nitric Oxide production, believed to help maintain telomere length. Deep breathing moves us into a more peaceful, parasympathetic mode, reducing unnecessary stress response. Pray. People with spiritual faith live longer. Meditate. Meditation has been shown to improve telomerase production as well as help with many other types of health challenges. Other Spiritual/Mindfulness practices of eastern origin including yoga and many martial arts including taichi and qigong have been shown to be beneficial. Therapeutic grade essential oils can help you relax even more. Focus on the present. Maintain perspective. Learn to live your life in parasympathetic mode and activate fight/flight only when under immediate threat. We cannot always control the stress in our lives but we can control our response to it. Fake it until you make it. Smiling has been found to release beneficial endorphins which have healthful effects, even when we fake it. Cultivate positive emotions. Open your heart. Studies have shown that those who enjoy meaningful supportive social relationships live longer than those who do not. Grow breadth and depth in your social networks. Develop your interpersonal skills. Practice empathy and love the one you’re with, in a manner appropriate to your relationship, of course. Find your purpose and dedicate yourself to it as best you can. Outdoor electromagnetic fields are different than those inside our homes which are also filled with WiFi and other modern transmissions. Enjoy the negative ions which can have a positive effect on mood and health. When weather permits, go barefoot or lie in the grass to benefit from the earth’s healing magnetic field. Think of improving your health as a cyclical process. You add or improve an awareness, you build that into a behavior and then a practice, you assess its affect and then you go back and adjust and build some more. Most cyclical processes involve an element of assessment. Compared to subjective assessment, objective tests provide a track record that supports proactive management. They are typically influenced less by extraneous factors and harder to deny. Use objective measurement for a better understanding of how your health is doing. Test at regular intervals to highlight changes over time. If your results are low, work on the above tips and improve them! If they are high, keep up the good work! Want to Measure Your Telomeres? We’d be happy to get that done for you through our association with SpectraCell Laboratories in Houston Texas. SpectraCell is the only lab to make telomere length testing commercially available in the United States at this time. More information about this test is available for you to read on the link to the.pdf document under “Related Posts” below. To compliment publication of this post, we are pleased to offer you a special discount of $20 for the next four weeks through April 7, 2015. If you’d like to learn your biological age and gain this interesting new perspective on your health condition, why not save $20 and order your test this month? Contact us with your private questions or to have us run this test for you. Please leave all other questions in the comments section below. Are you an MD, DMO, NP or PA? Just wondering, I like to know what I am dealing with. I am interested in getting my telomeres tested, but only live on soc security, and with my adult disabled daughter. I had breast cancer 7 yrs ago bilateral mastectomy, chemo etc, and had cancerous colon polyps 3 yrs later, and was diagnosed with metastatic cancer last June, but I could tell something was wrong a year before. I am the 11th woman over 4 generations in my maternal family line. It would seem there is a genetic component, but…I had th latest panel of 17 markers tested, and they haven’t found a connection. It is frustrating, since my mother was 1 of 10 daughters, and most of my first cousins, are (23) female. I worry about them and my daughter. Consequently, I wonder if perhaps we have short telomeres, since cancer is a disease of aging. Most of us were post menopausal at diagnosis, with one exception. Would you know of any way there is a lab or Dr. That could help me get a reduced cost? I do have Medicre, but I am sure they will not pay. I am sorry to hear of your health challenges. It must be frustrating at times and worrisome for you and your family. Unfortunately I am not aware of another physician nor a research study which would offer a cheaper price for the test. That said, since you believe most of the diagnosis’ for cancer in your family lineage occurred during post menopause years for the women involved, it is reasonable to assume that that the aging of telomeres is at least part of the problem. Following the recommendations in the post would make sense for you and your daughter. Losing weight, becoming more physically active – this may be as important as not smoking, following a healthy diet with good quality fats (decreasing all sugar, including alcohol), building and maintaining healthy gastro intestinal flora, practicing the maintenance of a joyful state of mind, and of course discontinuing any smoking or exposure to smoke if that is a current habit, would be important to improve health outcomes. Good luck to you! I am a Doctor of Chiropractic and a Certified Traditional Naturopath. I also have Diplomate certifications in nutrition with two different agencies.